A revolution for the Egyptian press? Iqbal Tamimi asks: Where now for the Egyptian press? THE Egyptian press changed in one very obvious way when Mubarak’s reign ended. His wife, Suzanne Mubarak, suddenly disappeared from the front pages. News of the First Lady’s ‘activities’ had been regularly reported by the Egyptian press. Articles featuring Mrs Mubarak had totalled more than all other articles on Egyptian women put together. She was depicted as the Chair of almost every charity organisation and the supporter of all women’s groups. No reader of Egypt’s newspapers could fail to see the virtual halo above the First Lady’s head. This despite the fact that her family would enjoy caviar and the finest brands of Swiss chocolates – as reported by the BBC – while most of the Egyptian children and mothers whose rights she was supposedly advocating were struggling to find enough to eat. Forty per cent of Egyptian people live on 2 dollars a day or less. The media is not the only institution to stand accused of having used national funds to inflate the ego of the First Lady. Academic institutions, supposedly ethically driven, also wasted a great proportion of their funds on promoting her image. The bottled-up feelings of anger against this were vented following Mubarak’s ousting. The protestors demanded that many establishments should be held to account for corruption, including Cairo University, claimed to have poured 6.5 million Egyptian pounds (1.1 million US dollars) into a ceremony granting Mrs Mubarak an honorary doctorate. A number of academics considered the award an insult to academia. On the first day of resuming education, following the ousting of Mubarak, 2,000 education employees demonstrated, accusing the university’s administration of squandering 6.5 million Egyptian pounds of public money on a doctorate award ceremony held for Suzanne Mubarak in September 2010. The president of the university, Hussam Kamel, denied the figure, saying that only 200,000 pounds (34,000 US dollars) had been spent, on some decorations that were necessary for the ceremony. It was striking how, the very morning after overthrowing Mubarak, all the newspapers in Egypt came out praising the revolution and criticising the very regime they had been applauding and glorifying just few hours earlier. This sudden change was worrying for all those who understand the moral responsibility of the press and the ethics it is supposed to adhere to and respect. It was shocking to see the rhetoric of all the newspapers change suddenly overnight, reflecting political hypocrisy. The majority of Egyptian journalists turned from one extreme to its opposite – from glorifying Mubarak to a fierce attack on him and the way he ran the country during his reign. It was the consequence of many years of the media’s lack of transparency and credibility. There had of course been many restrictive laws and measures impeding the work of journalists, such as no freedom of access to information, and the requirement for journalists to seek approval for their work from the Minister for Media or their immediate boss before publication. Now, as the old institutions disintegrated, it seemed that censorship had too. The sudden and striking change in these policies, from total control to freedom of expression, was a shocking contrast in most newspapers. It was obvious, for example, in ‘Aljomhoriya’ (‘The Republic’), which had been one of the system’s tools. Aljomhoriya journalists defended Mubarak’s system furiously until the very end, and attacked the revolution. Then they turned against Mubarak after he stepped down, and attacked his system. Only a small number of journalists and publications did not suddenly change their position after more than 30 years of polishing the old regime’s image. These included Rose Al-Yousef publications, which were known to support the policies and actions of Mubarak’s son Jamal, and Ahmad Ezz, an ex-parliamentary member, Chairman of the Planning and Budget Committee of the People’s Assembly of Egypt, member of the National Democratic Party who is accused of corruption. 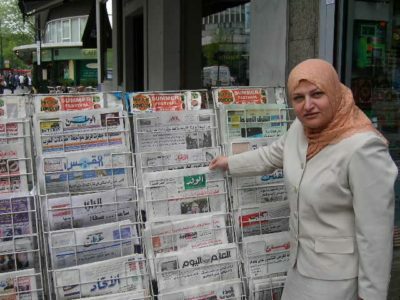 Even though Rose Al-Yousef newspaper is a national publication, its Editor-in-Chief, Abdullah Kamal, has declared that they will continue to defend the former regime. The Egyptian Information Minister, Anas El-Faqih, has also resigned from his post, saying that he will defend the policies of the former regime and cannot defend the current system. There are now calls to abolish the Ministry of Information and to codify the role of the General Authority for Information and the Press Office for Foreign Correspondents. This means there will be no more dominance over the media through the old tools of the system, such as allegations of communism or suggestions that every innovation was a planned conspiracy to misguide the public. Should the Ministry of Information be abolished the media would be liberated. We could expect a more democratic press climate, diversity of views and a decline in political hypocrisy and careerism. It is well known that the heads of media institutions and all the media managers supervising and controlling the activities of the Egyptian media were appointed by the Supreme Council of the Press, chaired by Safwat al-Sharif, one of the founder members of the National Democratic Party (NDP), who has also been accused of misusing public funds and corruption. The selection of top media managers and directors was controlled by the President of the Republic, who conveyed his opinion to the Supreme Council of the press. This was necessary, it was claimed, for security reasons. It caused friction between journalists, as heads of departments were chosen according to standards of security and loyalty to the regime, rather than by journalistic skills or professional experience, and there were dramatic differences in wages between those with similar skills working within the same institution. For example, the salary of the Editor-in-Chief of Al Ahram newspaper could reach up to 2M Egyptian pounds a month (339,000 US dollars), his earnings coming from his salary, commissions and rates of publications. Other journalists working at the same publication with the same experience as the Editor-in-Chief earned less than 2,000 Egyptian pounds a month (339 US dollars), because the managers controlled the bonuses and offered them to their own close circles. Following the success of the revolution, there have been inevitable changes. It will be interesting to see what happens to the journalists who were in favour of the former regime and benefited from the old system. How will their employment conditions be affected when the dust settles? Will the public trust them, following their sudden shift of loyalty? What about the Egyptian women journalists’ representation, accounting for only 34 percent of the general assembly of the Egyptian Press Syndicate? Only 2,400 Egyptian women journalists are members of a press syndicate out of a total of 7,000 members, and only 7.7 percent of the Syndicate’s Council, or 13 members, are women. It remains to be seen whether Egyptian women journalists’ representation improves after the revolution, and whether their equality demands will be met. The extraordinary events in the Middle East and the desperate attempts in Bahrain and Libya to stamp out the revolution sweeping round the thrones of former dictators is the re-assertion of the people of a power they thought they had lost forever. And yet this has been achieved without foreign intervention thunders the West; neatly sidestepping the real issues here. It may not have been Western troops that caused the unrest that dethroned Mubarak et al but be very sure it was Western business the sowed the discontent that caused the mobs to take to the streets. Goldman Sachs lobbied for the reserves on the futures markets to be lifted under the Bush regime and of course got it…when could any American President say no to Jewish interests? It seemed so innocuous and innocent and what possible harm could it do. With the sub-prime scandal having wreaked havoc on the liquidity of market forces and ready cash for the venture capitalists a new source had to be found. And it was. The futures market played the greatest part in restoring the fortunes of the venture capitalists and their backers the bankers. With the reserves off the price of simple commodities could rise about the ceiling limit placed upon such things as staples by previous more modest regimes. The futures market has a habit round the world of becoming a self fulfilled prophesy. As the trading circulates with the upper limits removed no one wishes to break the chain by lowering the price of bread tomorrow or in the case the following budgetary period. So up went the price of fuel oils and gas as well as wheat. In the West this caused minor irritation as people knowing austerity was fashionable tightened their belts, sold the holiday cottage or cancelled the forth holiday, spent less nights out and absorbed the higher prices…and those prices are still going up with petrol, gas, electric and bread all rising along with all the other commodities carried by lorry anywhere in the western world. But the effect of even minor changes in countries where the dictator class creamed off the profits of oil, tourism and any other ‘state’ owned asset the effect was much more marked. When the greater mass of the population is just bumping along on the uncomfortable side of poverty the sudden hike in fuel for cooking and transport along with the 70% rise in the price of wheat spelled disaster. This really was a revolution caused by the price of couscous and cooking gas. The result was to bring people threatened with starvation of ever deepening levels of debt and poverty out on the street. In Tunisia they won a fairly quick victory against the obvious greed and dishonesty of those in power. Exit ‘hated greedy rulers’ along with a planeload of gold. Egypt was always going to be a harder nut to crack but in the face of persistence and the inability of the state thugs to beat people into submission…along with the desertion of the armed forces the hated rulers fled. Things are not yet right but Egypt has gone a long way to giving the people a voice. In Libya the pure brutality of the dictator and his family will possibly cause the defeat and subsequent bloodbath as revolutionaries are punished. As the House of Saud feels the cold desert winds blow around their interpretation of state/religious control and see the threats in surrounding countries they seek to prop up regimes that probably should not survive but will. The House of Saud with its open ended arms deal with the world’s only superpower in return for cut-price oil can well afford to send in troops to douse the flames of discontent. So will the revolution that has so thrilled the world founder by brutality? That may all depend upon a few rich dealers in the futures markets and they need to raise cash by betting on the gamble that they can push the price of basic staple still higher…but like the South Sea Bubble it could well yet bust and come crashing down round the ears of the architects of the unrest over the couscous and cooking gas. I am an editor and publisher of Holocaust poetry. I agree with Iqbal Tamimi that we need to be aware of the situation of Egyptian journalists, and all journalists in the Middle East, and do what we can to help them.